More on our outsourced future. The flow of goods through Mexico has risen 324% in the last ten years to $211 billion annually. At http://www.nauwarroom.org/ there are two UTUBE featuring a Congressman and Lou Dobbs on the super highway from Mexico. The Trans-Texas corridor (TTC), road and rail link system from Mexico to Kansas. The 4,000 mile $184 billion transportation network. A corridor 1,200 feet wide is to be built through Texas. Neoliberal plans call for outsourcing the construction and making it a toll road. U.S. Representative Tom Tancredo (R-CO) sent a statement in support of a press conference held in New Orleans by the Coalition to Block the North American Union during the SPP meeting between President George W. Bush, Canadian Prime Minister Steven Harper and Mexican President Felipe Calderon. Canada has announced a plan to extend the “North American Free Trade Agreement (NAFTA) Superhighway” network north in a way that would finish a continental grid designed to accommodate an anticipated tsunami of containers from Red China and the Far East. It’s called the “Canadian Intelligent Super Corridor” (CISCOR) and is expected to be a massive national transportation route designed to reach from the West Coast ports of Vancouver and Prince Rupert to Montreal and Halifax. As WorldNetDaily (WND) has documented, recent articles published in The Nation and Newsweek magazines have attempted to characterize the NAFTA Superhighway as a “conspiracy theory.” Yet, the CISCOR case study provides strong evidence that the continent’s ports, highways, and rail lines are being reconfigured into an inter-modal system emphasizing technological logistics and “inland smart ports” to facilitate the relocation of North American manufacturing to China. Inter-modal is a transportation economics reference to containers that can be transported on several different modes of transportation, including container ships, trucks, and trains, without having to be unloaded or repacked. According to the CISCOR website, the Saskatchewan-based CISCOR Inland Port Network of the cities of Regina, Saskatoon, and Moose Jaw is designed to serve “as the central logistics and coordination hub,” creating a Canadian east-west land bridge connecting three major North American north-south corridors: North America’s SuperCorridor, or NASCO, the Canada-America-Mexico Corridor, or CANAMEX, and the River of Trade Corridor Coalition. 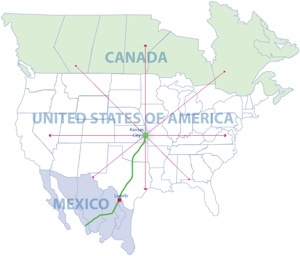 A multi-color North American continental map on the CISCOR website leaves no doubt the Canadian super corridor is designed to interface with the NAFTA Superhighway, extending into Mexico. Yet still more will be needed to accommodate the coming tsunami of Red Chinese products. That is why the Canadian national transportation plan to open Prince Rupert and Vancouver as deep-water ports capable of handling the new class of 12,500 container-capacity post-Panama ships now being built for China. The CISCOR strategy falls under the umbrella of Canadian Prime Minister Stephen Harper’s Asia-Pacific Gateway and Corridor Initiative as defined by Transport Canada, the Canadian counterpart to the U.S. Department of Transportation. WND previously documented how the Canadian National and Canadian Pacific Railroads are included in Canada's Asia-Pacific Gateway and Corridor Initiative, positioned to operate as NAFTA railroads. Under the CISCOR plan, the Saskatchewan cities are defined as an “inland smart port,” as are Kansas City, San Antonio, and Denver in the U.S. The plan to make the Saskatchewan cities an inland port center for utilizing the West Coast deep-water ports in British Columbia as the input point for millions of containers from Red China and the Far East. A quick look at the continental map shows the physical location of the Saskatchewan cities qualifies them to be an ‘inland port’ because the area can function as a switching center, with easy access either to CANAMEX or to what NASCO refers to as the NASCO Corridor, the complex of Interstate Highways 35, 29, and 94. A majority of the new containerships entering the world fleet in the next five years will be post-Panamax vessels ready to transport cargo from Red China, Southeast Asia, and India to North American ports already strained with capacity.